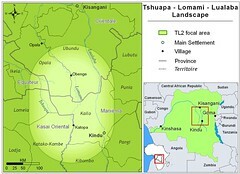 « Plants are Last — in the Forests of the Ituri and the Lomami. The hunter, the bonobo, and the shotgun that killed her. We thought we were making progress in 2009. Every village had poster pictures of bonobos and other completely protected species. “Not to shoot!” Certainly the killing would go down. 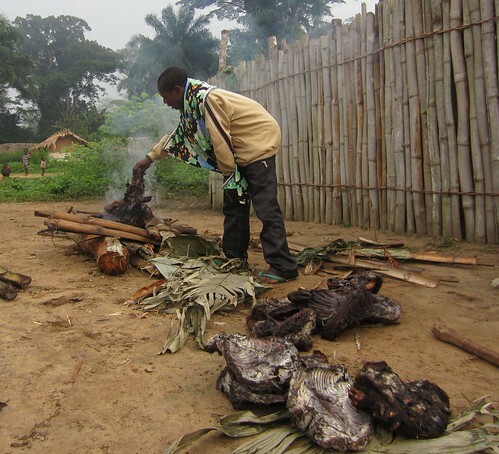 Hunter from Tshombe Kilima puts bonobo carcass on the fire. More progress in 2012: a hunter in Tshombe Kilima voluntarily came forward with the bonobo he killed. We had spoken with the village chief. 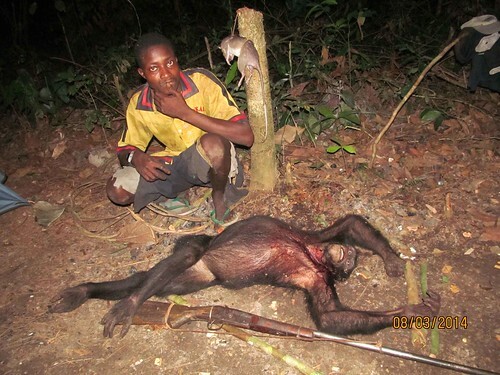 “An animal never to shoot.” The hunter brought the dead bonobo and we burned it openly. The village witnessed. Village watches the burning bonobo outside the project TL2 compound in Tshombe Kilima. But just a few months later, walking from Tshombe Kilima towards the Park we met hunters. 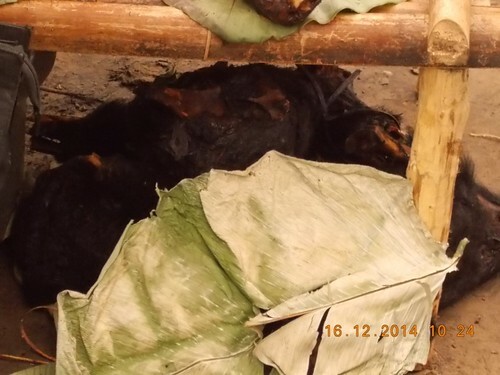 The bushmeat they were packing out was completely enclosed in a white fake-burlap bag. 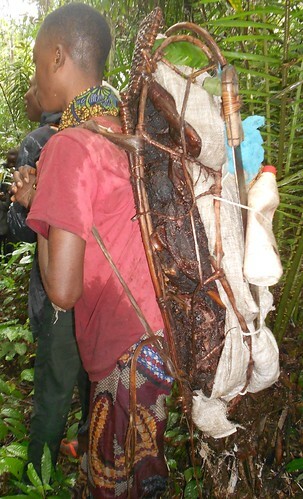 This hunter’s bushmeat is completely enclosed in a bag. Usually meat is exposed; there is less rot that way. Not so with completely protected species. If it is a carcass a hunter should not have, specifically bonobo, better to hide it. We were walking without a park guard. We could not ask them to open their pack – no authority. This hunter is carrying their meat in the usual way. There are only 6 park guards for 8,870 km2 of park and the TL2 project is not their boss. Generally the guards accompany our patrols, but sometimes one or more will disappear for weeks at a time at the order of their chief. We do not even know where they have gone. Omo, TL2 staff, on patrol with a park guard. Poachers are sitting on the left. The following year, 2013, again in Tshombe Kilima our team leader, Kinois Kitoko, came back from patrolling the park with a dead bonobo and the shotgun. The hunter ran off, there was no guard, no ability to pursue him. 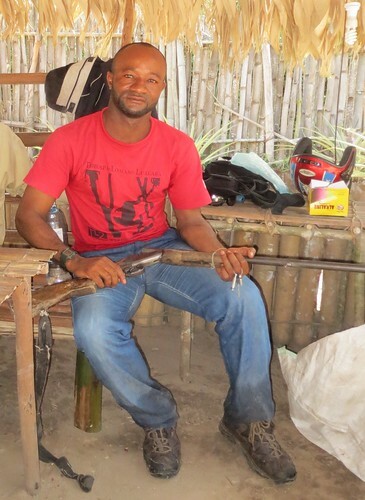 Kinois Kitoko, TL2 staff, with confiscated shotgun. Tshombe Kilima is at the end of the road, close to the park. Hunters come from far away to enter the forest there. Tshombe Kilima and Bafundo are both at the end of roads leading towards the park. Bafundo is another village at the end of a road, close to the park. 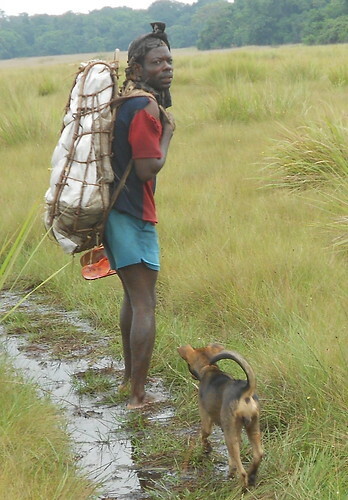 Hunters of many ethnicities come to Bafundo to hunt around and in the park. In the last three months two bonobo hunters have escaped from our teams when they were patrolling without guards. We got the bonobo carcass and in one case their shotgun, but there was no punishment. 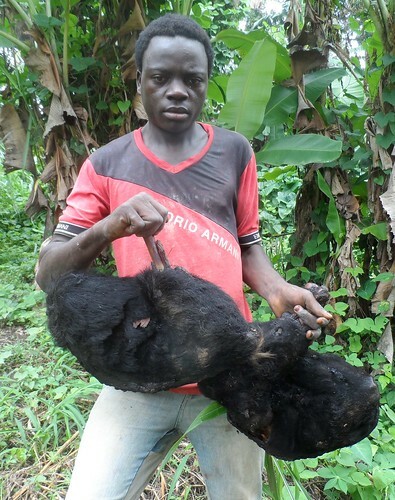 Hunter holding up parts of butchered bonobo. He fled that night. 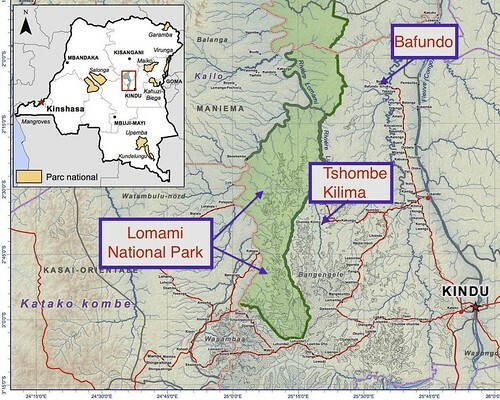 So we have NOT stopped bonobo hunting along the Lomami. Time to add a second method to patrols. What if there was no Market? Kindu is the only market for the southern TL2? What if real punishment at the end of the supply chain closed the bonobo market? 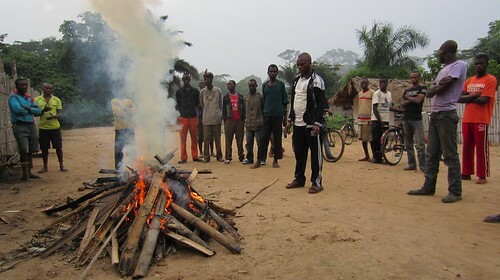 In Congo-Brazzaville there is a group called PALF that investigates wildlife crime and works with local law enforcement. One of our funders asked if there was someone we wanted to send to PALF for training. Leon Salumu went and spent 6 weeks. Leon always seems to follow events at several levels — ideal for investigative work. Leon came back at the end of November; at the same time one of PALF’s supporters agreed to help us build our own law-enforcement initiative. Already there is change. Leon started by canvassing all 8 Kindu bushmeat markets. 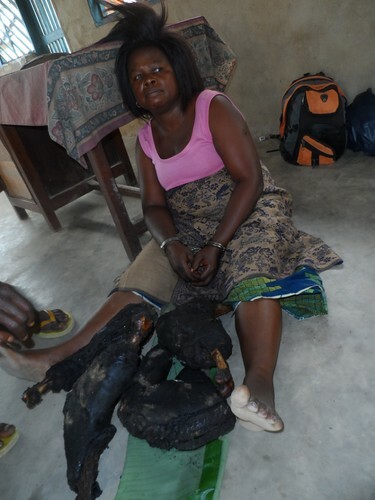 The pieces of bonobo meat this woman is selling at the Alunguli market, she bought at the Makengele market. 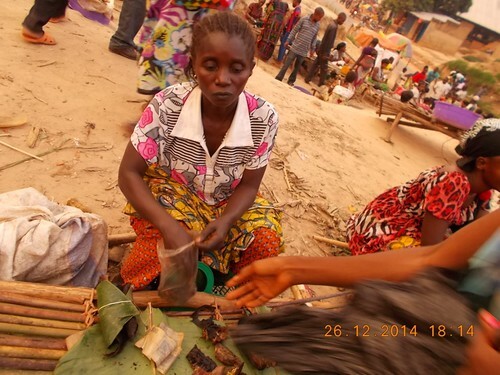 In December and January, Bonobo was sold openly in all three communes of Kindu. The price of an entire smoked bonobo varied between $15 and $70 depending on the size of the carcass. All 8 markets had bonobo meat at least once a week. But only a couple were big turnover markets for Bonobo. A stash of Bonobo meat under the stall at the Makengele market. An important first market is Makengele where bushmeat comes in by bicycle and motorbike from the Olangate road (direction of park). Bonobo as you buy it at the market. The women who sell bonobo do not have a particular clientele. Some say it is a high quality meat, on the level of leopard or elephant meat. 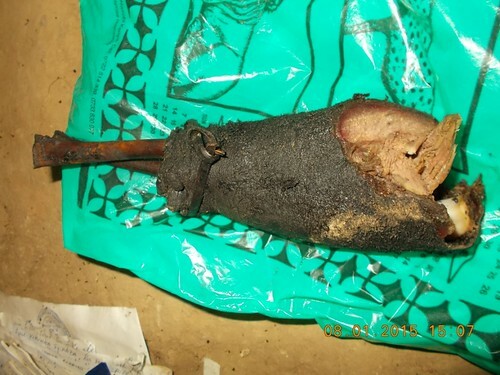 Others say it is just bushmeat with a special attraction for pregnant women. If they eat bonobo many believe it will make their children tougher and able to hold their ground in front of bullies. 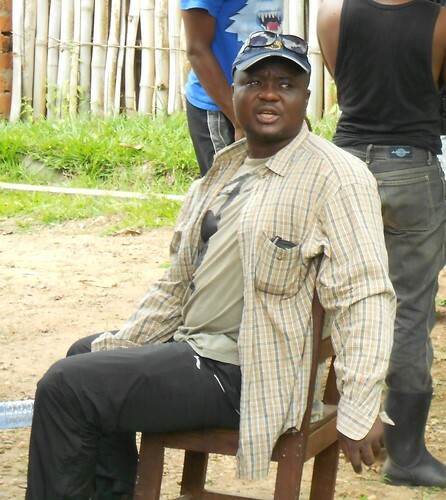 Bonobo seller arrested in one of Leon’s operations. Five arrests were made and as a result, since February, bonobo meat has nearly disappeared from the markets. His informants keep a constant vigil. Two of the arrests are being pursued at a high level of justice. This is the challenge: Will these arrests lead us to higher – protected people who support the bonobo hunters? This is another challenge: Leon must educate and motivate the lawyers and judges. Laws concerning fauna are not known and not taken seriously; not very long ago a politician passed out elephant meat among authorities to strengthen his position. Now those same authorities should arrest that politician? Leon is positive that attitudes will change. 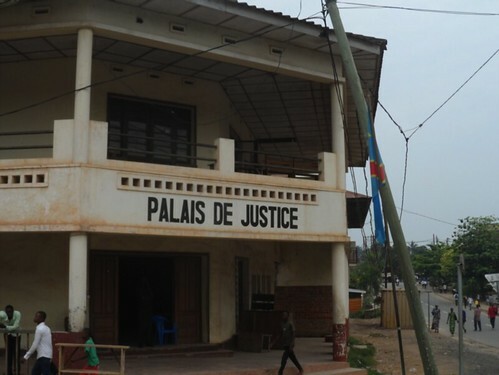 Leon will spend a lot of time here, at the courthouse in Kindu, during the upcoming months. This entry was written by Terese Hart, posted on 2015-03-22 at 3:13 pm, filed under Bonobo, Bushmeat, Kindu. Bookmark the permalink. Follow any comments here with the RSS feed for this post. Trackbacks are closed, but you can post a comment. Wow. It sounds like you are making incredible progress. You are amazing. I’m Michele Barbaro, an italian guy very impressed about your amazing work. 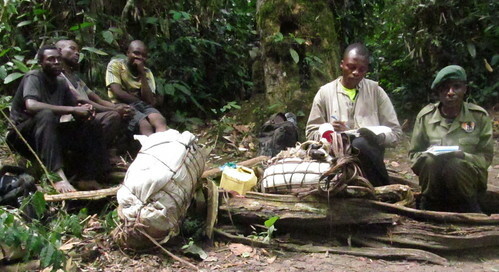 One one my biggest goal in life, is helping you preserving bonono and the wild forest. Is there any chanches to come in Congo and work with you? I ‘ll be very be to be a volunteer. Please, Ms. Hart, if you could give me a personal mail, i’ll be very happy to explain you my story. Many thanks for what are you doing. That’s great news! Thanks for all you do. Stay safe.